www.bungyjump.cz - bungee jumping, stunts and parties. All about Bungee Jumping, Bungee, Bungy, Bungee history. 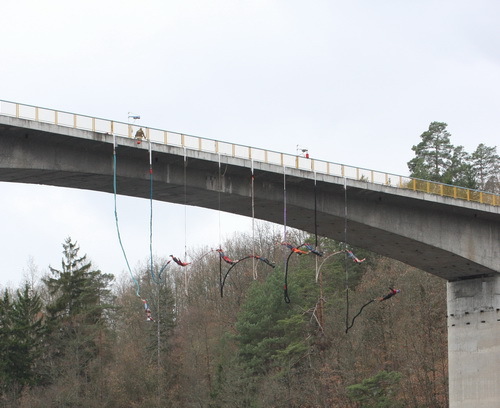 Bungee Jumping from the highest bridge in Czech from 62 m above the river Hačka near the Chomutov - Horní Ves, 90 km from Prague. We are doing the show-jumping and stunt-jumping for the presentation of your company, your product, dangerous sequence in the movies or clips. We prepare the plan of action, plan of show-jumping on the base of your enquiry. We are doing show-jumping and stunt-jumping from the buildings, bridges, towers, cranes and transmitters.